I received a text message from The Hubster early this afternoon, around lunch hour. He mentioned he was chatting with his workmates (both women), and the subject of waffles came around…don’t ask me how. Well, to the point, he ended up having a powerful hankerin’ for waffles, and asked if we could have them for dinner this evening. Considering that I married a man who, when I met him, ate pretty much the same four foods every week (cereal, pizza, Kraft Dinner, and a terrifying pasta concoction he called “Stuff” *shudder*), and still honestly couldn’t care what he ate from day to day, as long as it “isn’t gross” (a direct quote from the legend man himself), I thought, well why the hell not. 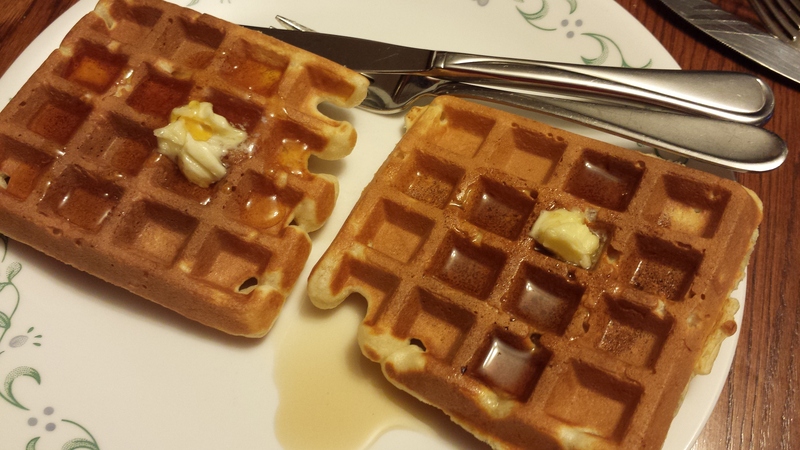 Waffles for dinner? Let’s Doooo Eeeet! This recipe is from a cookbook I inherited from my father many years ago, named “The Family Circle Encyclopedia of Cooking” ©1990. There aren’t many recipes I’ve made from this gigantic tome, but I knew this waffle recipe would be a good one. Feel free to mess around with it a bit, as long as you keep the proportions right. Add your favourite flavourings and spices (vanilla, nutmeg, cinnamon, allspice, etc. ), change the milk to something else (buttermilk? half sour cream? thinned out cream cheese? how about a dairy free choice like soy, rice, or coconut milk? 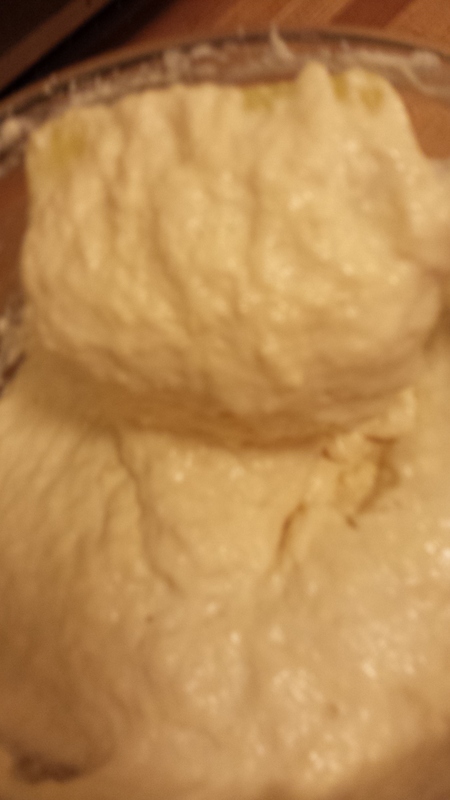 ), and swap out some of that AP flour for something more interesting (multigrain? Buckwheat? What about half oats pulverized in a food processor?). While my guy is Definitely Not A Fan of me messing around with classic recipes, hence why I made the recipe as-is, I strongly encourage everyone to try something different and kick your culinary masterpieces up a notch or two! 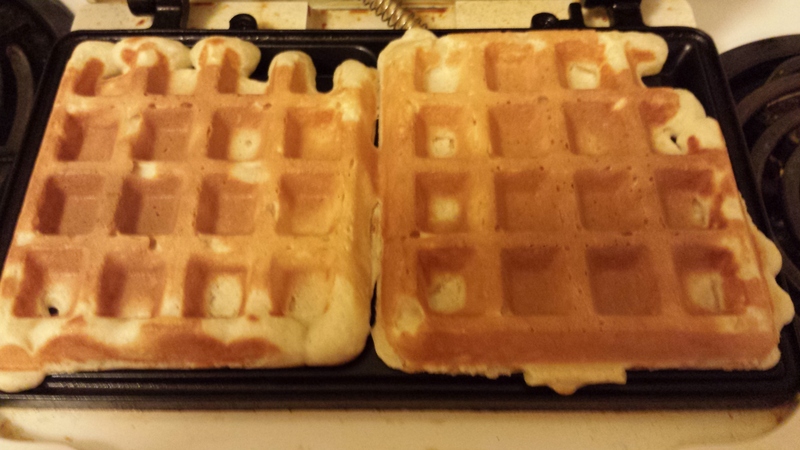 Preheat waffle iron; if you can choose temp, make it moderately hot. 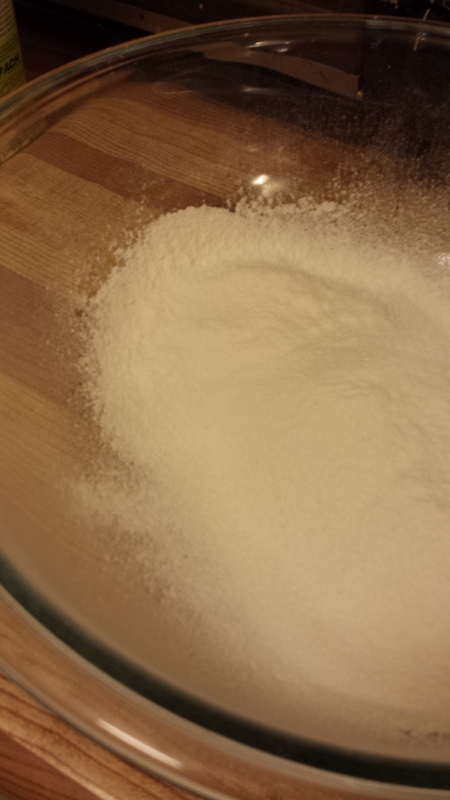 Sift all dry ingredients together; set aside. 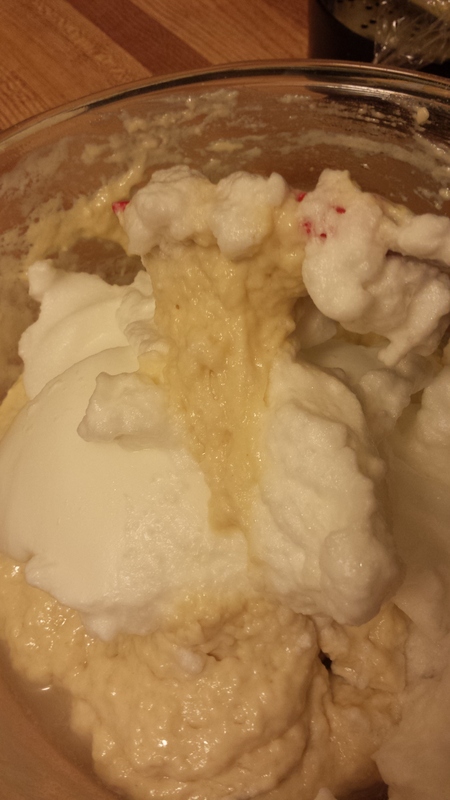 In a small bowl, beat egg whites until stiff but not dry/granular; set aside. In a medium-sized bowl, beat egg yolks together; stir in milk. 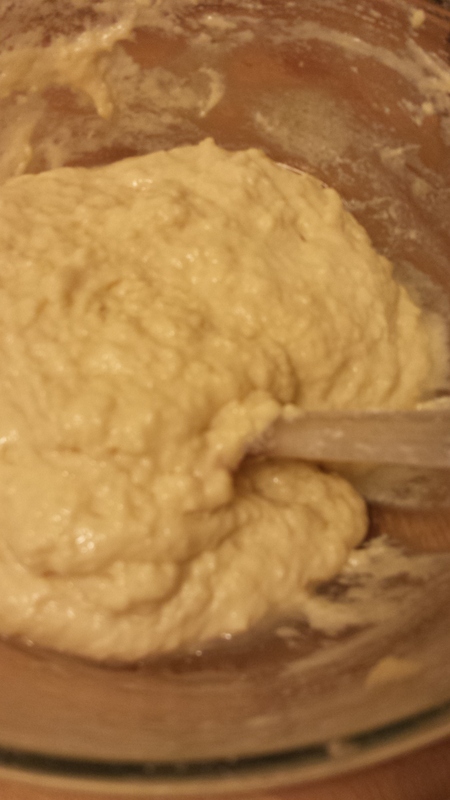 Add dry ingredients to egg/milk mixture and mix just until combined; stir in oil. 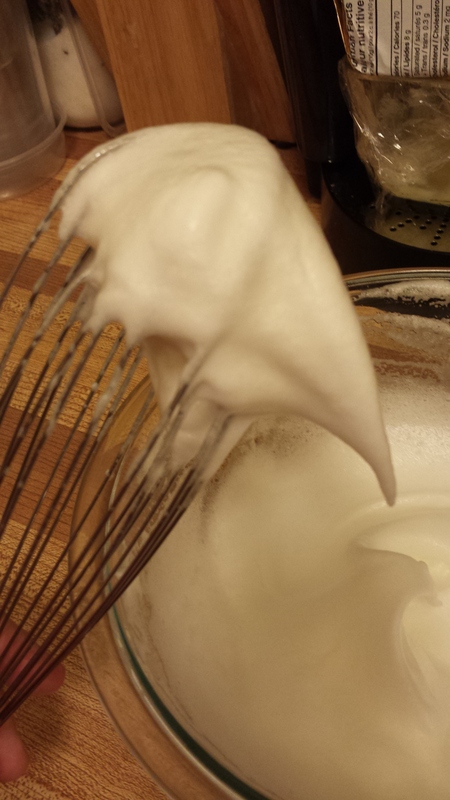 Fold in egg whites gently and mix until all combined. 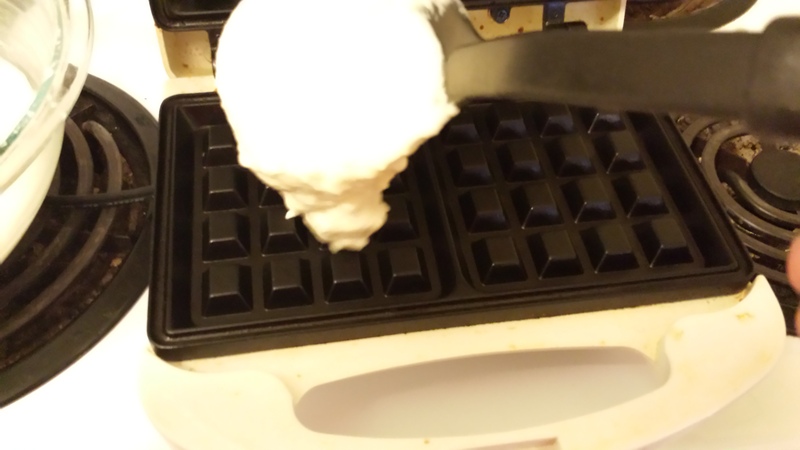 Spoon approx 1/3 cup batter into waffle iron sections; bake until crisp and brown, about 4-5 minutes. Serve hot with butter and maple syrup or other sweetener.